Many of you must have heard Beatles' song 'I'll cry instead.' But here is a live situation where an elderly Chinese couple chose to 'stay instead' of moving away and letting a motorway build. 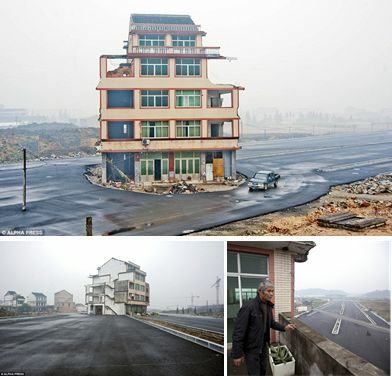 And as the elderly couple owns the land in the city of Wenling, in Zhejiang province, the authorities cannot force them out of the building they are living in and have left their house intact right in the middle of the under construction highway. To ensure the couple’s safety, adjacent rooms in the building have been left intact but all their neighbours have moved out, according to local media. The road paved through the Xiazhangyang village leads to the Wenling railway station and is yet to be officially opened.